The free mobile App for iOs and Android is now adapted for tablets. Download it now in the Apple App Store and on the Google Play Market. The mobile app’s functionality now includes Calendar events. 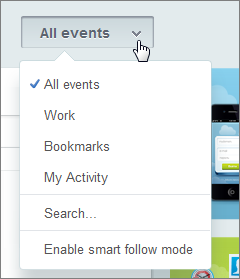 That is, now you can view and cre ate events from the mobile device. The Desktop App for Windows has a new tool: Bitrix24.Drive. It’s ETA is the end of March. This feature provides synchronization between local files and files stored in Bitrix24. 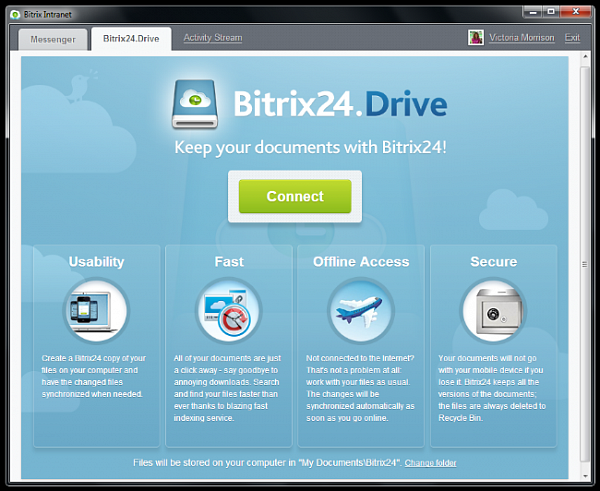 As soon as the Bitrix24.Drive is connected, a special folder in on your local computer is created and the documents currently located in your Bitrix24 portal are copied there. Modification of these files from either location will trigger synchronization either immediately, or the next time that the connection is active (if you make changes on your local device and are offline at the time). Shortly after its release for Windows, Bitrix24.Drive will be accessible in the Desktop App for Mac OS and not only files from the user’s personal file section will be synced, but also from Shared Documents and groups. Take a look now at the new blocks to the right of the Activity Stream in the cloud service, which allow all portal users to learn about the new capabilities of the mobile and desktop apps and to install them in in just by clicking. When Smart follow mode is on, only the posts for which you are the author, recipient or wh ere you are mentioned in the post will be ‘followed’ automatically; that is, when new comments are added to them, they will be moved to the top of the stream. You also automatically follow any post you comment on. Any other post can be followed by choice. Another important change is that your tasks and events for the day are now accessible on each page in the Standard and Free plans for quick planning. 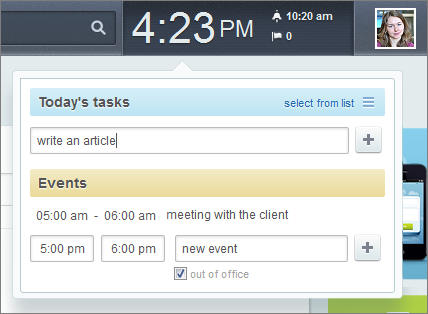 Previously, this was only available in the top plan, but now all users can plan their day in the Bitrix24 cloud service. There are new interfaces on list pages and element detail pages. There is now a master menu at the top of the screen and an indicator for unfinished activities, along with quick-launch buttons to create new objects. A filter constructor is added, and the filter itself is located above the list, and can be collapsed. 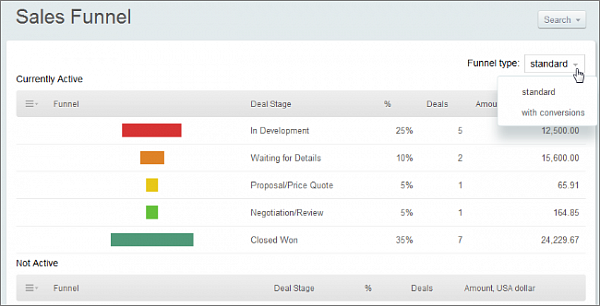 There are also two options for the sales funnel display mode: standard mode, which shows each level’s numbers, and with conversions, which includes the deals which have progressed lower in the funnel (thus in the funnel below, all “Negotiation/Review” level deals would be included in the “Proposal/Price Quote” level). 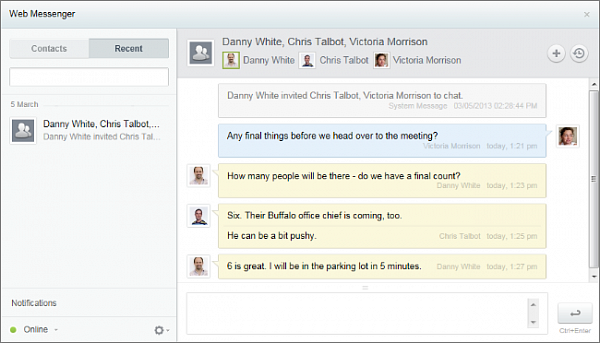 Now messages sent to clients from the CRM can be based on message templates. Each sales associate can create as many templates as desired. These templates can be made available to other users. 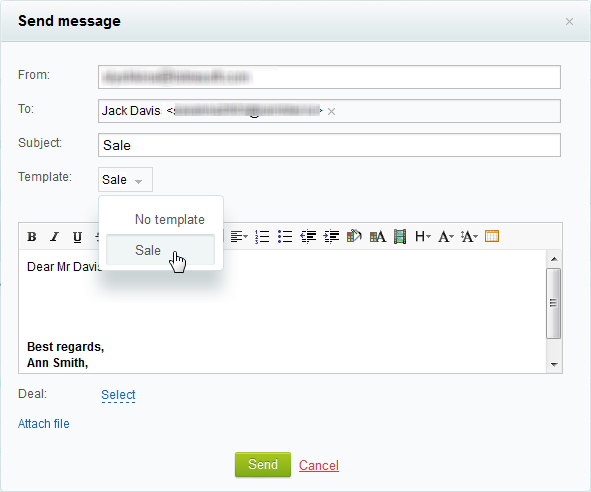 Templates can include (dynamic) information from CRM objects, allowing personalized emails to be sent quickly and easily. 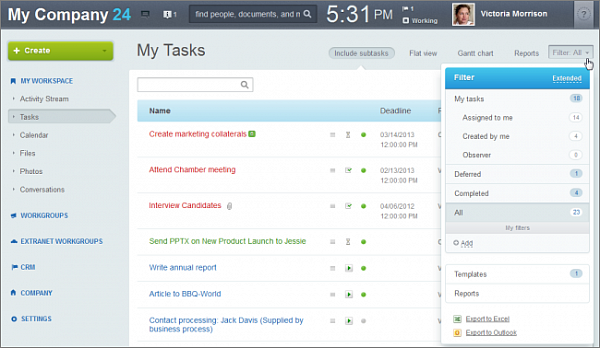 The work area for tasks is substantially larger, now that the filter is hidden by default. The filter itself has undergone some changes, and now you can use saved filter or create your own by adding the desired parameters and saving it. 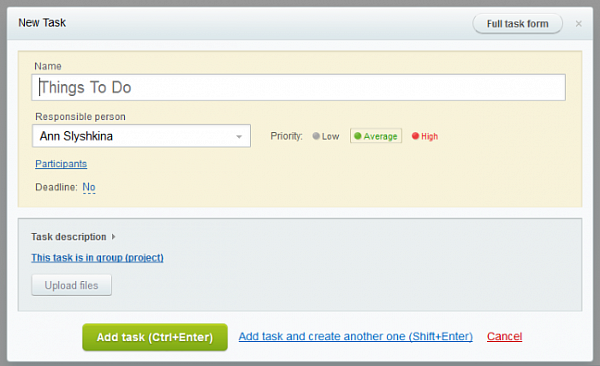 There is a new task creation form. The form has a minimum number of fields in it – only the most important ones. However, you can always got to the full form if you need to create enter expanded task parameters. Now any user can initiate group chats with up to 50 participants (only 12 in the free version, of course). Group chats are available in the chat archive. Watch for Part B - coming in April!